Known as Uptown Toronto – Grand Touring Automobiles in Vaughn, the dealership recently completed a thorough redesign in Lamborghini's new image program, on the Lamborghini side of the showroom. EDITOR'S NOTE: The Lamborghini dealership is in an new building, not just a redesigned showroom as a previous version of this story indicated. 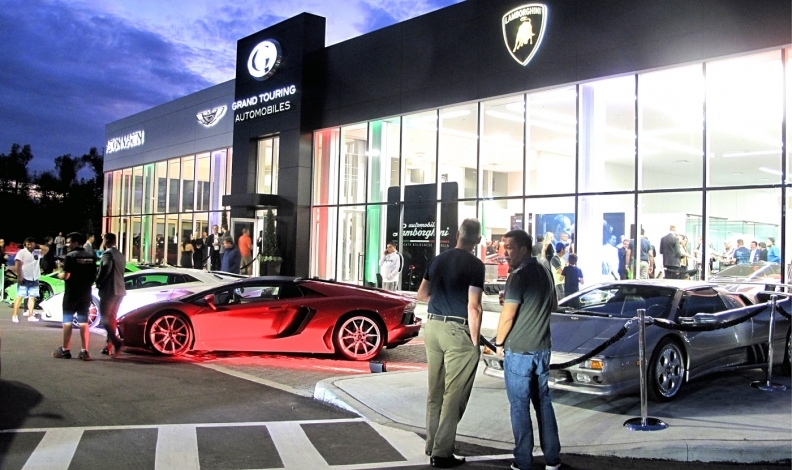 TORONTO --- Grand Touring Automobiles, a Toronto-based dealer group that represents several luxury auto brands, unveiled its new Lamborghini showroom with a splash Thursday night. The dealer group has two locations in the Greater Toronto Area and sells Jaguar, Land Rover, Karma, Rolls Royce, Lamborghini, Bugatti, Bentley and Aston Martin. In addition to its well-established location in Toronto’s west-end, which wile be relocated to a new facility in the east end by the end of the year, it also has a location in Vaughn, which concentrates on Aston Martin, Karma, and Lamborghini. Known as Uptown Toronto - Grand Touring Automobiles in Vaugn, it recently moved into newer and larger facilities across the street from its previous building, and marked the occasion with a grand opening on Oct. 5. It is the first dealership in North America to feature Lamborghini’s new image program, on the Lamborghini side of the showroom. The other side of the dealership features Aston Martin. 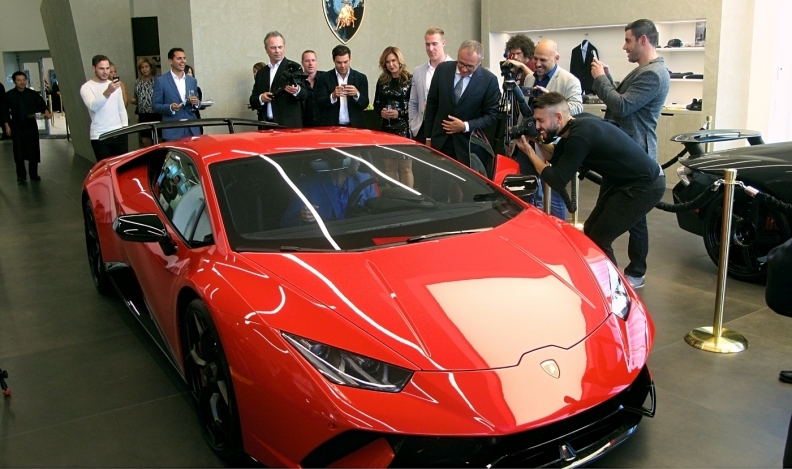 The guest of honour was Lamborghini CEO Stefano Domenicali, who was making good on a promise to Paul Cummings, the owner and dealer principal of Grand Touring Automobiles. Domenicali told Cummings that if the dealer group led the way with the new image program, he would personally attend its grand opening. And he did. Domenicali said he wants retailers in Canada to get ready for more customers, as it anticipates healthy sales growth from its upcoming new SUV, the Urus, expected in showrooms in 2018. Through the first ninth months of 2017, Lamborghini has sold 165 vehicles in Canada, up from the 156 sold during the same period last year. Domenicali also made one of Uptown Toronto’s customers — Rob Boyko — very happy, by officially giving him the keys to his new Huracan Performante, the first one sold in Canada.